Varsity - the latest in college caps. Hat Freeman two stores. Hats, shoes. 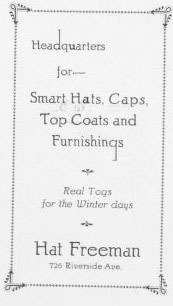 Headquarters fro smart haps, caps, top coats and furnishings. Real tags for winter days. Hat Freeman, 726 Riverside. Boys! 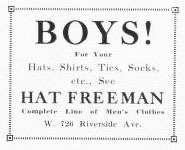 For your hats, shirts, ties, socks, etc, see Hat Freeman. Complete line of men's clothes. 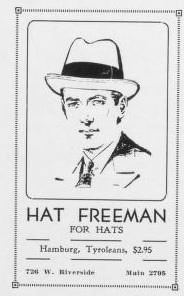 Hat Freeman for hats. Hamburg, Tyroleans, $2.95. 726 Riverside. Main 2705.